Destination weddings are often less expensive than traditional weddings due to their smaller size. In addition, you’re already in the destination where you plan to spend your honeymoon, and many resorts offer special complimentary weddings or affordable wedding packages. You’ll also spend a lot less by choosing an all-inclusive resort where much of the food and beverage expense is part of the lodging costs that will be assumed by your guests. You can also save more by having your wedding during the slow season in the destination you choose. ● What kind of things do you like to do? ● What are the travel plans of you and your guests? distance and time in mind when choosing your destination. ● What’s your budget — and the budget of your guests? ● What are the entry requirements? ● Government legislation now requires all people traveling to and from the U.S. or Canada to have a passport. ● What are the marriage requirements? before you can get married. Other requirements may include blood tests, legal documentation that you are indeed single, etc. Select your resort: Now that you know where you are going, choose where you want to stay. ● What kind of wedding do you want? religious ceremony. Whatever your image of your wedding, you’re sure to find the perfect backdrop to your special day. resort, this can help defray the costs of a wedding reception. ● Consider your guest list. inviting to your wedding before you decide where it will be. stay a certain number of nights or reserve a certain number of rooms. Also, check to see if there are any additional fees. resorts also have sister resorts that allow children, so you can get married at one and honeymoon at another. Contact Becker World Travel! We will help you with reserving airfare and our resort for you and all your guests, if needed. Once everything is reserved, we will put you in touch with the resort’s on site wedding planner to start planning the details of your dream wedding! Make the details clear. It is customary that the bride and groom pay for the accommodations for their attendants, and some wedding couples may pay for travel costs, as well. Decide what you are able to do and make these details clear to your attendants when you ask them to be part of your wedding. Many brides take their wedding dress on the plane as carry-on luggage, but BE SURE it is an approved size, as some airplanes do not have extra room for oversized carry-on pieces. Some airlines allow the large "coat closets" in the first-class cabin area to be used for bridal gown storage, please check with the flight attendant for assistance. have one of your guests bring it back and return it for you. Packing for a wedding AND a honeymoon can add up to a lot of luggage. A good suggestion is to have some of your guests bring some items with them or ship items to the resort (if allowed). If you are shipping anything, make sure you leave extra time and use an overnight service, such as FedEx, not regular mail. documents by regular mail. Mail service throughout much of Mexico and the Caribbean can be extremely slow. Rely on fax transmissions and overnight services such as FedEx for delivery of papers. Also, bring extra copies of all paperwork to your destination, just in case. Here is a handy Destination Wedding Checklist that will help you stay organized, right on schedule and most of all, sane! What Becker World Travel can do for YOU! There are so many options out there, how do you choose the right resort? 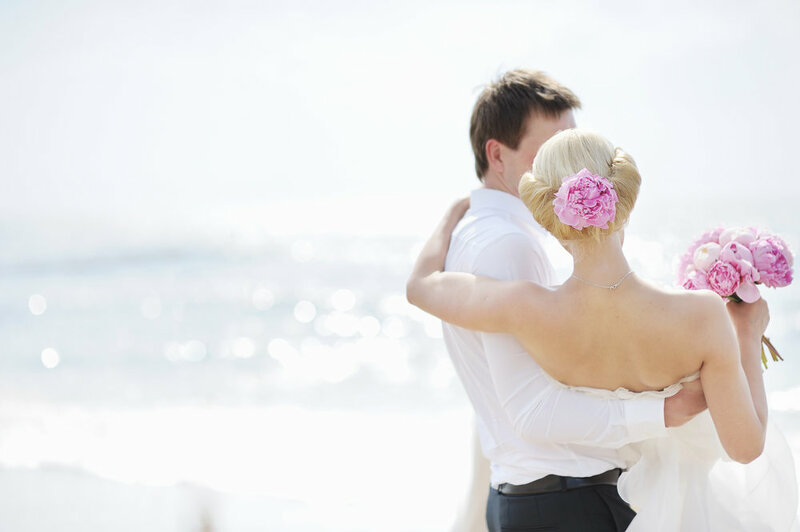 Do you know the best resorts that offer complimentary weddings and additional group incentives? Probably not, but we do! We have more knowledge than you can ever gather from an online search. The biggest reason to book with a travel agent is that we can make recommendations and help you plan a trip that meets your needs and budget. We help you avoid wasting time and money on the things you are not interested in and lets you focus instead on your Destination wedding. My clients love this part. I listen to their wants and needs and make my recommendations based on this all within a budget they are comfortable with. Planning a Destination Weddings can be EXTREMELY time consuming. When people finally make a decision on where to have their wedding they fail to consider the amount of time they've spent researching their trip. On average it takes 10-20 hours of your time to research your destination wedding. This time can easily double if you're researching a new and unfamiliar destination. Then once you have booked, you put in several hours working with the Destination Wedding Specialist sometimes waiting for days for a response. We are right here to answer any and all questions you have in an incredibly timely manner thus relieving your stress. Working with a travel agent saves you a ton of time and gives you the priceless peace of mind that it was done correctly. Travel agents are a “one stop shop.” They can handle every aspect of your Destination Wedding—from airline tickets to lodging, ground transportation, activities, tours and more. This is a huge benefit if you have guests who are planning on attending your wedding. Having one person handle all the details is a big plus. If you have any questions about who has booked and for what dates you have one person to contact. It is a much more convenient, efficient way to book your group. Travel agents have changed over the years in the way that they deal with their clients. Our biggest goal is to create a long lasting relationship with our clients and strive to be their go-to person when our clients book a vacation. This means that they need to offer personalized service so that their clients come back. Since I have been in this industry for almost 20 years and have a strong base of repeat customers, I get to know my clients preferences which helps me when I am recommending resorts. I have some clients that HAVE to have an ocean view, some that appreciate really good service and would pay more for it and some that are foodies and need to have a good selection of restaurants. I really know my clients and they appreciate that. Hopefully you will find some of these tips helpful. And of course if you have not planned your destination wedding or honeymoon yet, I would love to help you. Thanks for reading!